The Holy Bible is a book consisting of the Scriptures of Moses, the prophets and the apostles (the Old and New Testaments). We believe that the original manuscripts were the dictates of “one directing Mind” (God), (2 Peter 1:21). These writers were the instruments of God’s hands, some whose names are unknown, ranging from a shepherd to a king in status. While they never met in a committee nor consulted one another about the words written, we believe that these writings are the inspired word of God and the authoritative rule of faith and conduct for all Christians (2 Timothy 3:15-17; 1 Thessalonians 2:13; 2 Peter 1:21; 1 Corinthians 2:13; Hebrews. 1:1; 1 Corinthians 14:37; Nehemiah 9:30; John 10:35). We do NOT consider the various translations as the Word of God (just the original manuscripts), but that these translations from the original manuscripts have been born out of need for the Word of God to be transmitted to men of different races and languages. We do NOT claim that these translations are without error; for the translations are the works of mortal men who have made no claims that their works are the products of the inspiration of God or the assistance of the Holy Spirit. The doctrine of the Trinity which professes Jesus is “God the Son” is unscriptural. God the Son is a concept created by man (a manufactured concept) not found in any scripture (the inspired Word of God). First, “God the Son” is not synonymous with “Son of God”. The most common titles ascribed to Jesus by the Apostles in their preaching of the gospel are Jesus “The Christ” and Jesus “The Son of God”. (John 20:31) – “But these are written, that ye might believe that Jesus is the Christ, the Son of God; and that believing ye might have life through his name”. Both of these titles (Jesus “The Christ” and “The Son of God”) describe first and foremost his relationship to God. In the first case he is the one Anointed (Commissioned and empowered) by God. In the second he is the one whose father is God. Neither of these titles have any associations with the Son actually being God Almighty. The bible makes clear that Jesus was something more than just a “mere man”. That “something more” was revealed in the manner of the Lord’s begettal (birth). Paul taught that “God was in Christ” reconciling the world unto himself (2 Corinthians 5:19) not “incarnated” as the Christ. Jesus was the manifestation of God, as he himself testified (John 14:10). In nature he was the same as all mankind, “tempted in all points like his brethren” but in begettal (the manner of his birth) Jesus was divine for he was anointed by God with the Holy Spirit “without measure” (Acts 10:38; John 3:34) and it is in that sense that Jesus differed from all men before or since (Hebrews 4:14-15 and Hebrews 9:24). Jesus was “made of a woman, made under the law” (Galatians 4:4), and, therefore, in nature, identical unto “his brethren” (Hebrews 2:17). But he was also begotten “not of the will of the flesh, nor of the will of man, but of God” (John 1:13). The Holy Spirit came upon the virgin, Mary, and by this miraculous means, the Son of God was born (Luke 1:35). He was anointed with the Holy Spirit without measure (John 3:34), so that God overshadowed his development. This was all for the purpose of saving those who accept Jesus as the Christ. Christ led the way to life eternal for all. As he was strengthened by God to overcome, believers can also be strengthened (Philippians 4:13); as he was crucified upon the cross, we too must learn to deny the flesh to serve God in truth (Galatians 5:24). The very expressions that Christ constantly used, shows that he did not claim to be God in the absolute sense. He prayed: “Not my will but thine be done” (Matthew 26:39). He told his disciples: “My doctrine is not mine, but His that sent me” (John 7:16). If he claimed equality with God, he would not have used such expressions but would have claimed the will and teaching of the Father as emanating equally from himself. On the contrary, he taught: “I can of mine own self do nothing” (John 5:30), and “my Father is greater than I” (John 14:28). It is true, that Jesus Christ, as the manifestation of God, as one who completely gave himself to the will and purpose of the Father, could say: “I and my Father are one” (John 10:30), yet this statement is often mistaken as a claim of equality with God, however we overlook the fact that what Jesus claimed for himself, he also requested for his disciples. In (John 17:21) he prayed: “That they all may be one; as thou Father, art in me, and I in thee, that they also may be one in us.” If the former statement implies the equality of the Son with the Father, the latter statement includes it to involve all believers as being ONE! Where the word “LORD” is entirely capitalized in (KJV): It was done to show places where God’s name (Jehovah = H 3068) is mentioned. Transliteration: YHWH; yehôvâh, yeh-ho-vaw’; From H1961; (the) self-Existent or eternal; Jehovah, Jewish national name of God: – KJV: Jehovah, Compare H3050, H3069. Shortly before the first century A.D., it became common for Jews to avoid saying the divine name for fear of misusing it and breaking the second commandment (“You shall not take the name of the Lord, your God, in vain,” Dt 5:11). This resulted in the original pronunciation being lost. The name may have originally been derived from the old Semitic root הוה (hawah) meaning “to be” or “to become”. Whenever they read Scripture aloud and encountered the divine name, they substituted another Hebrew word, “Adonai” (which means “Lord” or “my Lord”), in its place. About the 13th century the term “Jehovah” appeared when Christian scholars took the consonants of “Yahweh” and pronounced it with the vowels of “Adonai.” This resulted in the sound “Yahowah,” which has a Latinized spelling of “Jehovah.” The first recorded use of this spelling was made by a Spanish Dominican monk, Raymundus Martini, in 1270. Note: This information is common knowledge for most Pastors and Bible students and found in various Biblical reference sources which are available both in print and online. 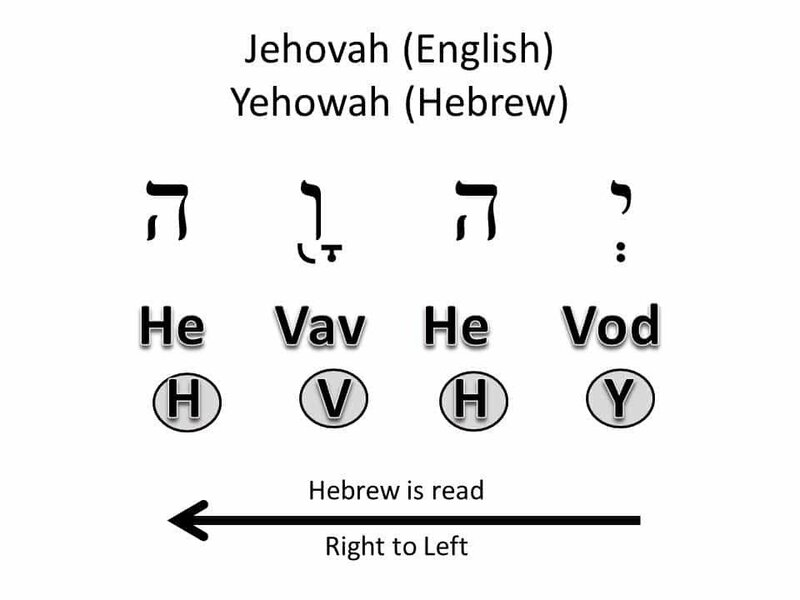 The word “LORD” which appears in all capital letters (KJV and others) is one of the instances where the Hebrew text was deliberately changed from YHWH, transliterated “Jehovah” in English. (The name “Jehovah” can only be used for God!) The change was marked by those who did it, and was said to be done out of reverence for the name of God, not out of a desire to deceive. Nevertheless, it does obscure the meaning of some of the verses. (Isaiah 42:5-8 (YLT)) “Thus said God, Jehovah,……..I [am] Jehovah, this [is] My name, And Mine honour to another I give not, Nor My praise to graven images”. Here, God’s name is clearly and explicitly revealed as Jehovah [“LORD” in KJV]. He is referred to by this name numerous times in scripture. In short, this is how God’s name should be treated throughout scripture. To show where God’s exclusive title, Adonay is mentioned in the “Old Testament”. This title is only ever given to God. Never a man, angel or idol. The word Lord [G2962] however is a respectful title and applies to both man and God. It is also important to note that the word Lord does not translate into the word God. This section provides some interesting information and compares scriptures when attempting to prove who Jesus is (or who he is not). One thing appears to be consistent with the scriptural presentation of Jesus; whoever Jesus was on Earth he is certainly the same person in Heaven with God today. (Acts 17:29-31) Forasmuch then as we are the offspring of God, we ought not to think that the Godhead is like unto gold, or silver, or stone, graven by art and man’s device. 30 And the times of this ignorance God winked at; but now commandeth all men everywhere to repent: 31 Because he [God] hath appointed a day, in the which he will judge the world in righteousness by that man [Jesus] whom he [God] hath ordained; whereof he hath given assurance unto all men, in that he hath raised him [Jesus] from the dead. Jesus Was "the Son Of Man"
Jesus Is "the Son Of Man"
Jesus Was "the Son of God"
(Hebrews 1:5) "For unto which of the angels said he at any time, Thou art my Son, this day have I begotten thee? And again, I will be to him a Father, and he shall be to me a Son?" (Matthew 16:16) "And Simon Peter answered and said, Thou art the Christ, the Son of the living God.17 And Jesus answered and said unto him, Blessed art thou, Simon Barjona: for flesh and blood hath not revealed it unto thee, but my Father which is in heaven." Jesus Is "the Son of God"
(Revelation 2:18) "And unto the angel of the church in Thyatira write; These things saith the Son of God, who hath his eyes like unto a flame of fire, and his feet are like fine brass"
(John 20:17) "Jesus saith unto her, Touch me not; for I am not yet ascended to my Father: but go to my brethren, and say unto them, I ascend unto my Father, and your Father; and to my God, and your God." (Revelation 3:5) "He that overcometh, the same shall be clothed in white raiment; and I will not blot out his name out of the book of life, but I will confess his name before my Father, and before his angels." (Revelation 3:12) "Him that overcometh will I make a pillar in the temple of my God, and he shall go no more out: and I will write upon him the name of my God, and the name of the city of my God, which is new Jerusalem, which cometh down out of heaven from my God: and I will write upon him my new name"
(Revelation 3:21) "To him that overcometh will I grant to sit with me in my throne, even as I also overcame, and am set down with my Father in his throne." (Revelation 1:18) "I am he that liveth, and was dead; and, behold, I am alive for evermore, Amen; and have the keys of hell and of death." (Hebrews 4:14) "Seeing then that we have a great high priest, that is passed into the heavens, Jesus the Son of God, let us hold fast our profession." (Revelation 20:6) "Blessed and holy is he that hath part in the first resurrection: on such the second death hath no power, but they shall be priests of God and of Christ, and shall reign with him [Christ] a thousand years." (Revelation 5:4-7) "And I wept much, because no man was found worthy to open and to read the book, neither to look thereon. 5 And one of the elders saith unto me, Weep not: behold, the Lion of the tribe of Juda, the Root of David, hath prevailed to open the book, and to loose the seven seals thereof. 6 And I beheld, and, lo, in the midst of the throne and of the four beasts, and in the midst of the elders, stood a Lamb as it had been slain, having seven horns and seven eyes, which are the seven Spirits of God sent forth into all the earth. 7 And he [Jesus] came and took the book out of the right hand of him [God] that sat upon the throne." (1 Corinthians 15:24-28 (NLT)) "After that the end will come, when he [Jesus] will turn the Kingdom over to God the Father, having destroyed every ruler and authority and power. 25 For Christ must reign until he humbles all his enemies beneath his feet. 26 And the last enemy to be destroyed is death. 27 For the Scriptures say, “God has put all things under his authority.” (Of course, when it says “all things are under his authority,” that does not include God himself, who gave Christ his authority.) 28 Then, when all things are under his authority, the Son will put himself under God’s authority, so that God, who gave his Son authority over all things, will be utterly supreme over everything everywhere." Most scriptures reflect Jesus as standing or sitting down at the right hand of God. It is irrelevant whether the "right hand" of God is stated as being figurative or literal, either way, it denotes Jesus at a position to someone other than himself.